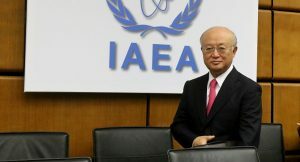 The Iranian Foreign Ministry’s spokesperson Sunday sent warnings to the Vienna-based International Atomic Energy Agency (IAEA) over US demand for the agency to inspect Iran’s nuclear program facilities including military installations. “We will continue to cooperate with the agency in line with previous commitments and we will certainly not cross any of the red lines set by the Islamic Republic of Iran,” Bahram Qassemi said in an interview with the IRIB news agency. US envoy to the UN Nikki Haley, who visited the agency last week, urged the UN branch to check Iran’s compliance with the 2015 historic nuclear deal known as the Joint Comprehensive Plan of Action (JCPOA) with world powers plus Germany. She pointed out at a press conference in Vienna that Iran with a history of lying could hide secret military locations where the Islamic Republic enriches uranium for military purposes. “We are encouraging the IAEA to use all the authorities they have and to pursue every angle possible with the JCPOA, and we will continue to support the IAEA in that process,” she said. For Qassemi, such a demand is unacceptable and violates the framework of the agreement. “We will completely try to safeguard the JCPOA, because it is a multilateral agreement to which we must all remain committed and other parties must also carefully fulfill their commitments,” the Iranian official said. The JCPOA requests Iran to curb its uranium enrichment to 5 per cent – making Tehran unable to manufacture nuclear weapons. Iran in return will see economic sanctions imposed on it by the West lifted. The Trump administration has criticized the deal arguing that it does not scale down Iran’s influence in the region. The US Treasury in July pressed new sanctions against Tehran over its ballistic missile program and human rights record. Iran lambasted the fresh sanctions saying the ballistic program was a civil program. Written by: KanelkaTagba on August 28, 2017. Posted by KanelkaTagba on Aug 28 2017. Filed under Gulf News, Headlines. You can follow any responses to this entry through the RSS 2.0. Both comments and pings are currently closed.